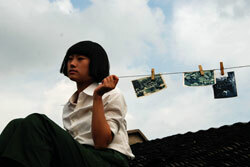 Betelnut - Along a sleepy Hunan riverside, two delinquent boys experience a summer of love and violence. Egg and Stone - A powerful autobiographical portrait of a 14-year-old girl's attempts to come to terms with her emerging sexual maturity. Enter the Clowns - Straight, gay and in-between Beijingers unleash a whirlwind of transsexual mayhem. Er Dong - A rebellious teenager endures the harsh realities of rural life in northern China, until an uncovered secret from his past changes his life forever. Little Moth - When an impoverished country couple adopts a crippled young girl and puts her to work begging on city streets, a battle soon ensues over her fate. Oxhide - Daily life in an impossibly cramped Beijing apartment takes on epic proportions in this, intimate portrait of a working-class Chinese family. Oxhide II - Breaking new ground, Liu Jiayin's follow-up to her masterful debut OXHIDE turns a simple dinner into a profoundly intimate study of family relationships.